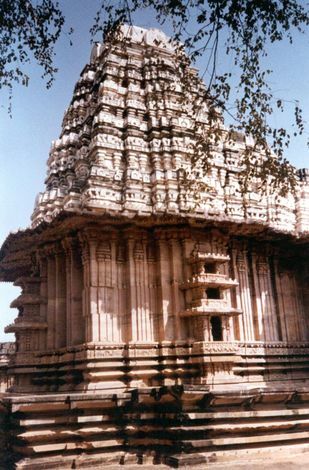 Northeast of Hyderabad and, more precisely, north of Warangal, the small but great Ramappa Temple at Palampet was built by the Kakatiya kings in the 13th century. 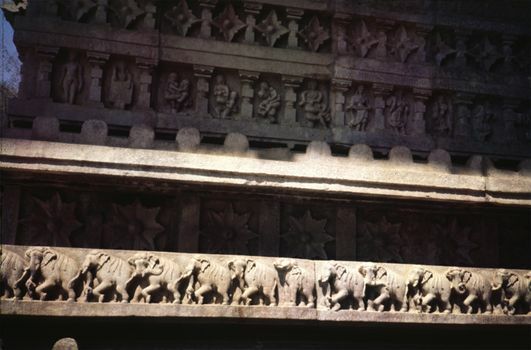 Compared to Kanchipuram, it's hardly known or visited, but that's all the more reason to see it. The scale of the temple is modest. 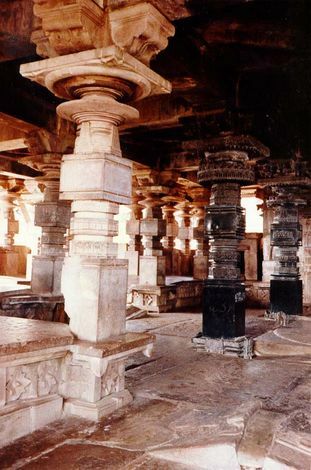 Attention was first drawn to Ramappa in 1922 by an archaeologist who called this temple and its neighbors "the brightest stars in the galaxy of medieval Deccan temples." This early attention led to some pretty crude emergency supports, like the two shown here. 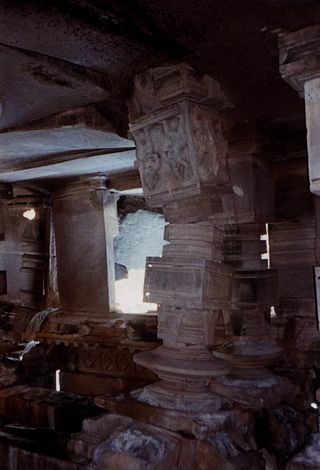 Settling of the foundation is the key problem: it's broken many of the pillars supporting the massive roof. There is only one small room--the sanctuary--in the temple: most of the "interior" space is no more than a porch. The massive columns, however, accentuate the sense of the horizontal by supporting a roof that would otherwise crush it out of existence. 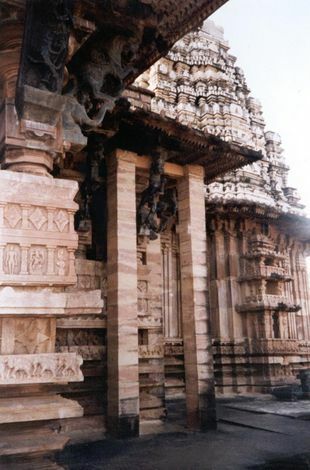 Like many of India's great temples (Khajuraho, for example), the effect is to make visitors intensely aware of their location in a cosmic, rather than geographical, space. 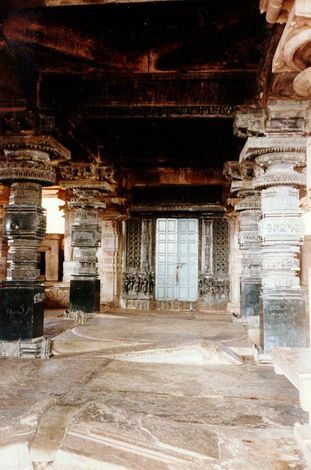 Black columns enclose the mandapa in front of the sanctuary with its lingam, here behind closed doors. 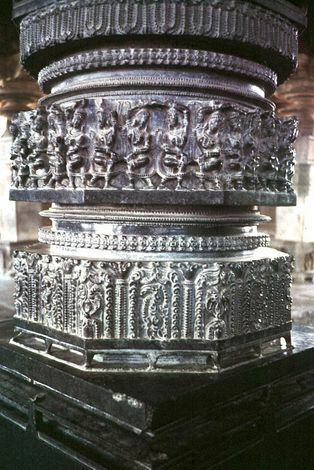 These four basalt columns had to be transported hundreds of miles from quarries near Bangalore. 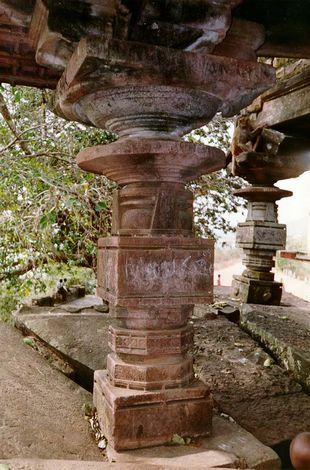 Repair work is urgently needed, but of a better quality than that of the past. 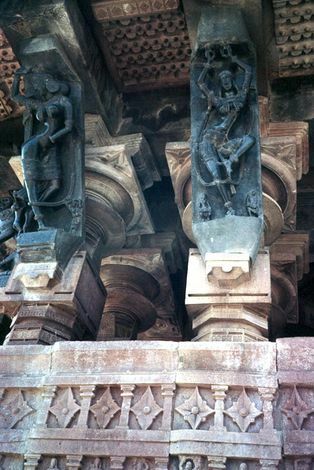 Carved figures on basalt brackets support the temple eaves. 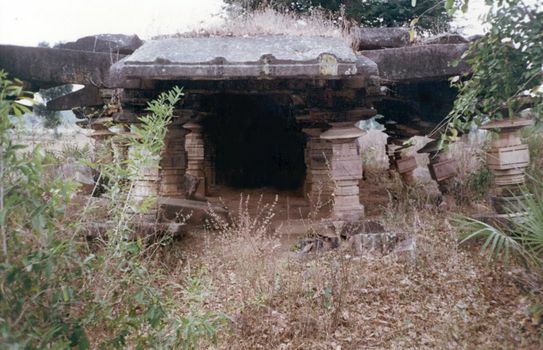 Nearby, other and smaller temples sit abandoned. 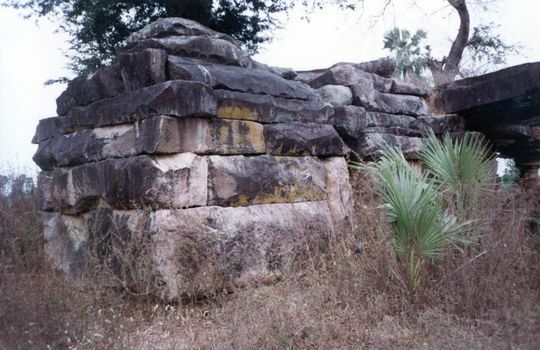 The same temple, seen from the rear.